We invite you to explore RaceJoy by checking out all the innovative features we offer. Download RaceJoy or Take a Tour. Please note that features vary per race. 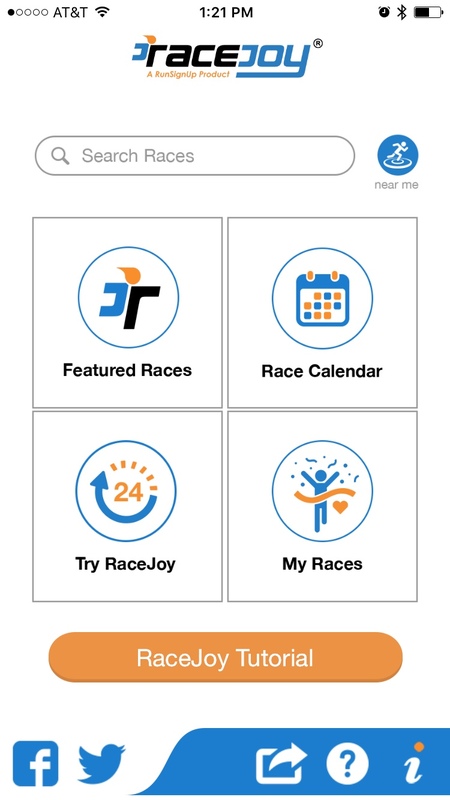 All events under Featured Races are RaceJoy Ready and offering live phone tracking, GPS-based progress alerts, Send-a-Cheer, NearMe alerts, and MeetUp features. Some also offer scored results, race-timed alerts and access to race photos. Races offering RaceJoy's live tracking and cheers have a RaceJoy Ready badge next to the listing. Search for races using various criteria such as races near you, by date or in a specific city. Featured Races are those race events that are offering RaceJoy's live tracking and cheers. Featured Races offer live phone tracking, continual progress alerts, and cheer sending. Track up to 50 people as they travel the official course using an interactive map in RaceJoy. Make sure to click the Start My Race button as you cross the start line. RaceJoy issues progress updates based upon you crossing milestones on the course. Typically, these are sent at every mile and include pace and estimated finish time. Participants receive alerts in audio format and spectators receive an in-app notification. Review all progress alerts received by going to the Buzz area and then clicking Progress Alerts. You have the option to post your progress to Twitter as you complete the course. You will see this during the initial set up and can adjust this in the Social area of the app. This is an example of what a progress update post would look like on Twitter. You have the option to include your personal performance information or simply that you completed the race. RaceJoy offers pre-recorded audio clips or custom text-to-cheer messages that you can send to a participant the days leading up to the race, on race day and afterwards. You can send custom text-to-cheer messages to participants at any time. Simply type in a message and it will be delivered in audio format within seconds of pushing send! Replay any cheers you may have sent or received by going to Buzz and then Cheers. This is an example of RaceJoy's pre-recorded Send-a-Cheer messages. If you are at the race site, you can receive NearMe alerts as a participant is drawing near. This is great help for getting that perfect photo and is a relay team favorite. 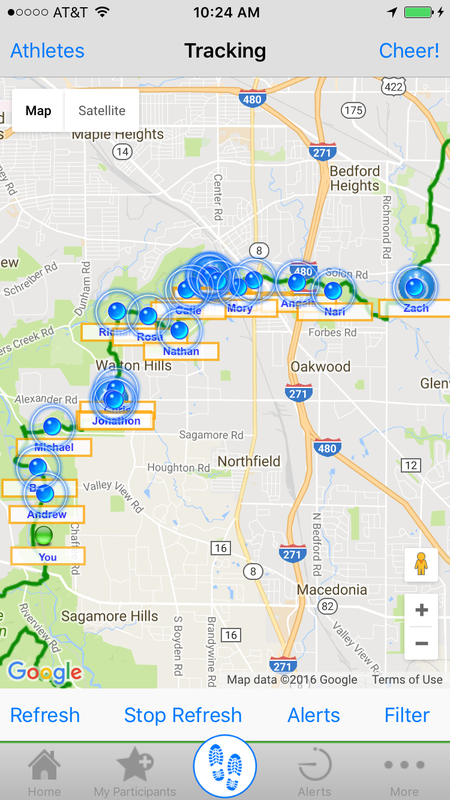 You can use RaceJoy's MeetUp to see where you are in relation to a tracked participant. This is very helpful at large venues and when you are in a location you are not familiar with. Some races offer scored results in RaceJoy. When this is available, you will see a results button appear when you enter the app and on the main navigation bar. When scored results are available, you will be able to see how you did in relation to others in your age group as well as the overall finisher information. Some races offer direct access to your race day photos from RaceJoy. When this is available, you will see a Photos Available banner ad appear after the race on the main race screen or your individual results page. You get to quickly see yourself in action on race day! Just click on the photo to find out about downloading the image. Most features in RaceJoy came from people just like you. So, please share any new feature ideas you may have by sending us an email to rockstar@racejoy.com.